I won’t even pretend that I didn’t make babkas this week because of the name. It’s a fun word for a dessert! I read somewhere that in Polish, babka means grandma, so of course that only encouraged me more. Grandma’s baking is the best, so how can I say no? Traditional babkas are made similar to a loaf of bread, but swirled with coffee, almond filling and chocolate or cinnamon. Like bread, even the cakes and pastry babka doughs are made with yeast. Yeast cake is the grandmother of modern cake, so the babka name is more than suiting. My inspiration to make these came from The World Famous Ratner’s Meatless Cookbook by Judith Gethers and Elizabeth Lefft. I made the recipe vegan, because I simply didn’t have enough eggs and was somewhat deflated by the lack of plain (non-chocolatey loaf) vegan babka recipes online. Everyone should eat babka pastries, no excuse! I’m still in the middle of cleaning out the freezer and found a few cups of blueberries from last season. So, the filling recipe was altered slightly to use all fresh or frozen blueberries instead of canned. They are heated up until juicy, then thickened and additionally sweetened with sugar. A little tapioca starch is supplemented to further thicken the fruit to a pie-filling consistency and boost the shiny appearance. 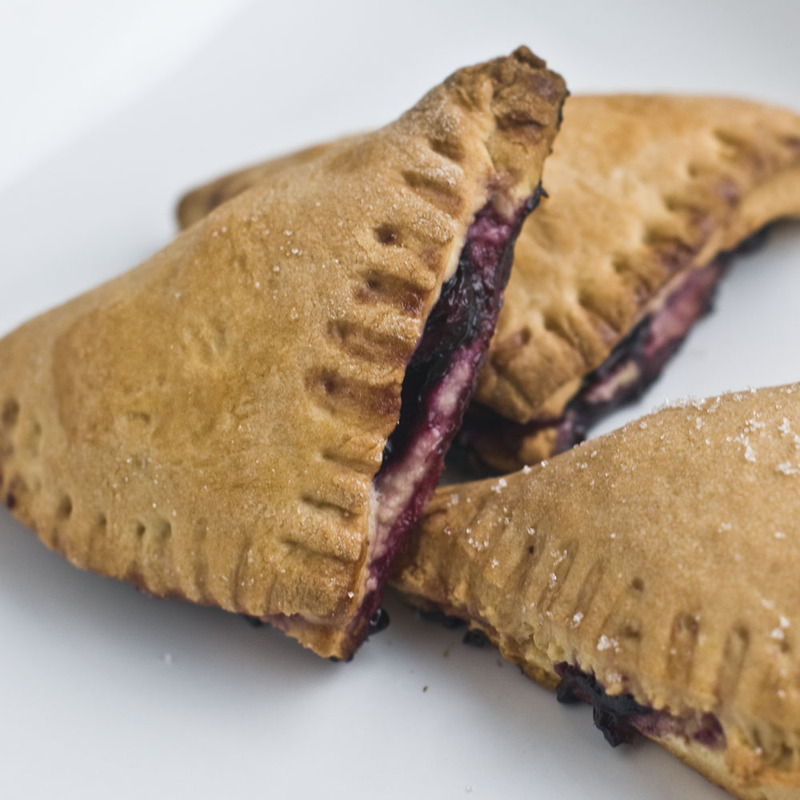 These babka pockets were (as you can see) literally bursting with flavor. Subtly sweet blueberry flavor! The babka crust was a bit time-consuming, but so worth experiencing in a pastry form. Firm, yet soft, sweet and comforting. This is definitely an old-school style recipe, with a vegan twist. But judging simply by appearance, don’t these just look like they came from Grandma’s house? Total comfort dessert that’s not overly sweet and doesn’t offer a stomach ache if indulged. If you love to bake, go for it! If you question your feelings for the sport, maybe try convincing someone to make them for you. 1: In a large bowl, gently stir together yeast and milk until yeast begins to dissolve. Beat in sugar, salt, arrowroot, vanilla, lemon extract and margarine. Slowly stir in half of the flour. Beat until mixture is smooth and thick. Add remaining flour and continue beating until a stiff dough is formed. 2: Clean and lightly flour a flat surface. Knead dough until it becomes smooth and elastic. Form into a ball, lightly oil outside and place in a bowl. Cover, place in a warm area and allow 90 minutes for dough to rise. 3: Meanwhile, heat small saucepan on medium-low. Stir together 1 1/2 cup blueberries, sugar and water. When sugar has fully dissolved, bring to a boil, then drop heat and simmer. Stir consistently. Filling should become more liquid-y and blueberries slightly deflated. Once this happens, whisk in tapioca starch until mixture thickens. Remove from heat and allow time to cool. 4: In a medium bowl, combine blueberry mixture and remaining whole blueberries. 5: Roll out dough on a floured surface into a 16 x 20-inch rectangle. Cut dough into 4-inch squares. 6: Lightly oil baking sheet or prepare with parchment. Place squares on baking sheet, then top each one with filling. Fold dough in half to make a triangular shape. With your fingers or a fork press the edges together. Brush with coconut milk and sprinkle with sugar. Allow pockets to sit about 30 minutes, until they double in bulk. 7: Preheat oven to 375°F. Bake pockets 20-25 minutes until bronze-brown on the top. Cool slightly or completely before serving. Like my sort of self portrait (reflection)? Opps.